FactoryÂ Â : Fujian valu display Co.,Ltd. Color: Black/White/Grey,etc. any color can be as required. Fujian Valu Display Co., Ltd.Â Â Â is one very experienced and professional manufacturer and exporter to make many kinds of displays and furnitures .We make and supply four main categories ,Â metal, wood, acrylic and LED signage products. Sometimes, we make PVC or glass displays according to meet the customers' special demand too. Our products are widely used for shops and supermarkets, as well as offices ,Â homes ,Â hotels ,meetings and warehouses etc. We were founded in 2005 year ,and now is located in Laicuo Industrial Park which is near the exist of Jinjiang Highway .Â We have around 14000 square meters work place and 200 professional workers. Meanwhile ,Â we have the complete workshops and efficient work-flow, from developing the sample to doing the mass-production and to shipping the goods .Â For example ,Â for the laser cutting, sawing, punching, forming, welding, polishing, pressing, digital or screen printing, powder coating, spray painting etc, we not only have the modern facilities to control, but also have relevant people to follow it to make the best. 1. We provide large amount of display stand to meet your urgent need. 2. We maintain strict quality control throughout the production process. 3. Factory direct sales, competitive price and timely delivery for you. 4. Direct fast-response sales services. 5. OEM/ODM and customize services offered. 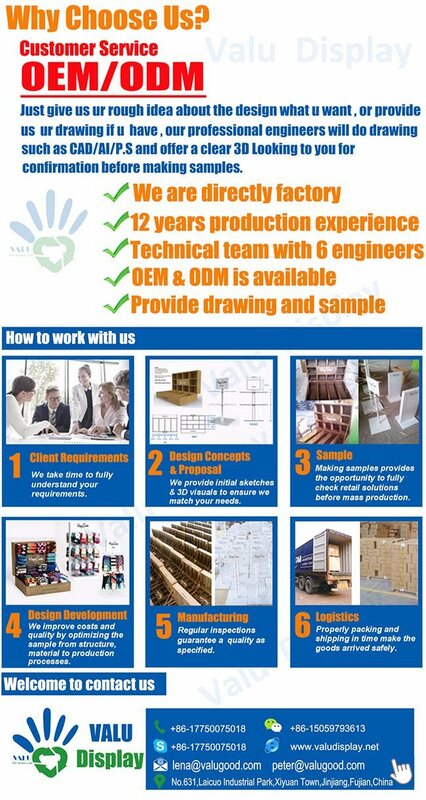 Welcome your drawings or samples. Q1: Are you aÂ manufacture or trading company? And what's ur main products? We make and supply four main categories ,Â metal/stainless steel, wood, acrylic and LED signage products. Sometimes, we make PVC or glass displays according to the customers' specialÂ Â Â demandÂ Â too. Our products are widely used for shops and supermarkets, as well as offices ,homes ,Â hotels ,meetings and warehouses etc. Q3: IÂ don't have the drawing, can you design it for me? A3: Yes, you can send us your ideas and suggestions of the design you want.our professional engineers will do drawing such as CAD/AI/P.S and offer aÂ clear 3D Looking to you for confirmation before making samples. Q4:What kind of surface finish your display stands could be? For metal items, surface finish could be backing, powder coated or chroming. Different surface finish could be different color and the cost is different. A5: OEM/ODM is welcome, From the concept to finished goods, we do all (design, prototype reviewing, tooling and production) in the factory.